Nasa is keeping an open mind, but says there is an urgent need to analyse the methane clouds for other chemicals that would either confirm or rule out life as the cause. The search for extraterrestrial life has received a tantalising boost with the announcement that Nasa scientists have detected wafts of methane on Mars that could be the emissions of microbes living deep beneath the surface. A seven-year survey of the red planet using three powerful ground-based telescopes in Hawaii, Arizona and Chile spotted giant plumes of the noxious gas being released from the ground in the northern hemisphere during the Martian summer. Over three months in 2003 around 19,000 tonnes of methane belched into the atmosphere from two valleys and a volcano, each about 620 miles apart, Nasa scientists report in the US journal Science. On Earth more than 90% of methane in the atmosphere is produced by living things as a byproduct of food digestion. But the gas can also be emitted by common geological processes in volcanoes and from fissures in ocean floors. 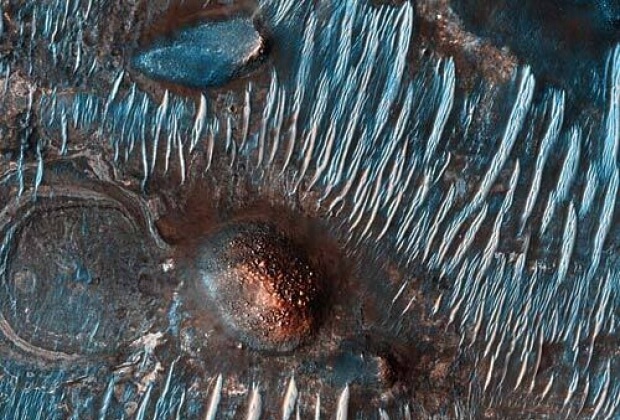 Nasa scientists calculate that a colony of Martian microbes covering 2,316 sq miles of the planet’s permafrost could account for the volumes of methane detected. Alternatively, the gas could be released by a community of ancient bugs living in aquifers nearly five miles beneath the surface, under the permafrost. Michael Mumma, director of Nasa’s Goddard Centre for Astrobiology in Maryland, US, said the agency was keeping an open mind about the origins of the plumes but added that there was now an urgent need to analyse the methane clouds for other chemicals that would either confirm or rule out life as the cause. Scientists previously sniffed a haze of methane around Mars in 2004. The European Space Agency’s Mars Express orbiter recorded levels of methane in the atmosphere at around 10 parts in a billion, suggesting that any releases from the planet were tiny. The latest study provides evidence that substantial amounts of methane could be released on a seasonal basis, but is quickly broken down in the atmosphere. The Nasa team used infrared detectors on the telescopes to confirm the presence of methane at three locations on Mars. One region, a valley known as Nili Fossae, is rich in clay minerals and was once covered in standing water. The two other sites are known as Syrtis Major, an enormous volcano nearly 500 miles wide, and the region of Terra Sabae. On Earth there are two geological processes that produce methane. One, called serpentinisation, requires heat, water and carbon dioxide. “It could be responsible, but if it’s ongoing it means there is hot rock below the surface, so Mars must still be active,” said Mumma. Methane is also produced in magma underneath volcanoes, but there is no evidence of active volcanoes on Mars. If the methane is the belchings of Martian microbes, these are either living about three metres below the surface, or deep beneath the permafrost, said Mumma. The gas is thought to build up during the winter and is then released in the summer as the warmth of the sun opens up fissures in the ground. Nasa’s next opportunity to analyse samples on the red planet will be provided by the Mars Science Laboratory, due for launch in 2011, which will carry more advanced sensors than any other probe to have set down on the planet.